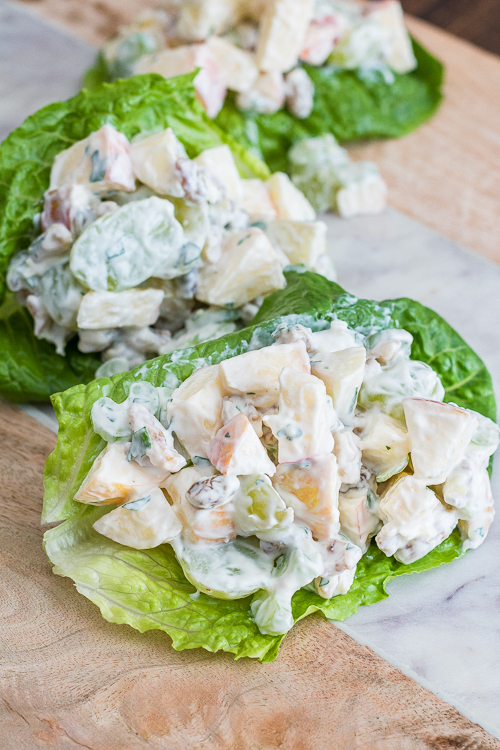 Easy Waldorf Salad is bursting with fresh fruit in an addictive pineapple yogurt dressing! 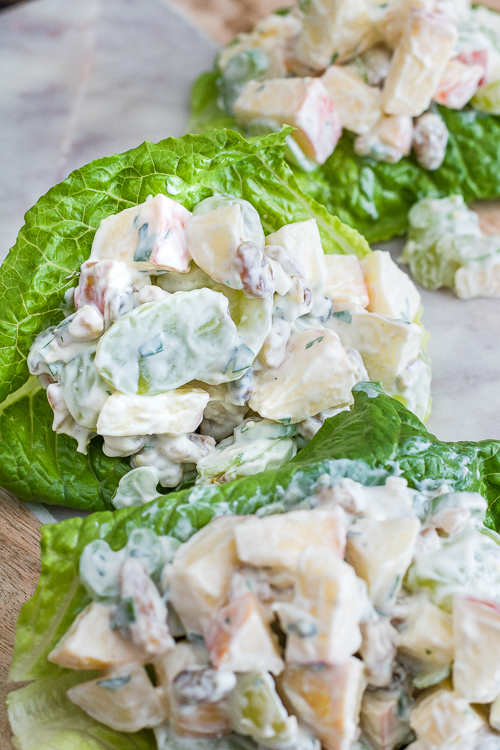 The original Waldorf salad recipe might have you asking lots of questions. There is fruit.. with mayonnaise… and a whole lot of different things going on. Today’s recipe is slightly different from the original, yes there is still fruit (and celery! trust me… it’s good! ), but it’s my version of the Waldorf salad dressing that makes it updated and oh, so yummy! Greek yogurt, crushed pineapple, honey, and a touch of parsley really sets this salad apart! Still sounds a little weird? Believe me, I get it! 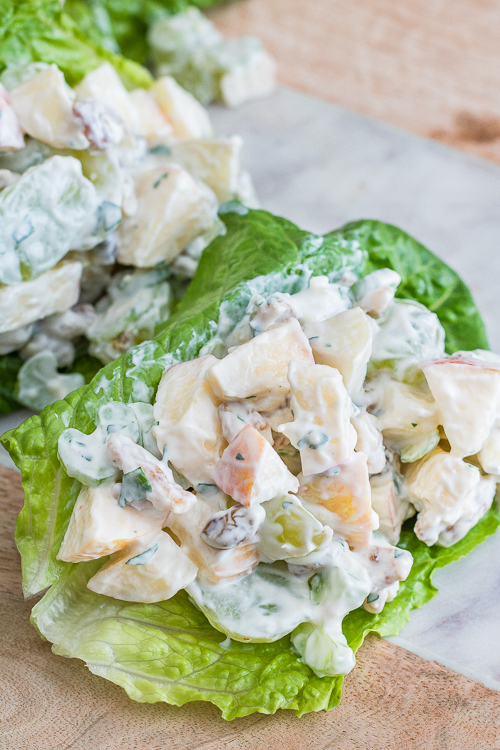 But, once you try this Waldorf salad recipe you will be hooked! It’s basically a fruit salad with a little extra pop! It’s crunchy, creamy, sweet, fresh, and delicious! A mixture of apples, golden raisins, grapes, celery, and walnuts all tossed in a sweet Greek yogurt dressing… I mean that sounds pretty darn good to me! Dice Gala apples, slice celery, slice grapes, and toast walnuts if needed. Place into a large bowl with golden raisins and set aside. In a small bowl, whisk together Greek yogurt, crushed pineapple with juice, honey, and parsley. Pour dressing on top of salad ingredients and toss to combine. Serve classically in lettuce cups or eat on it’s own! One of the ingredients that is actually my favorite is probably the one you think is the strangest. The addition of a little chopped flat leaf parsley in the dressing gives the whole salad this super fresh taste that I just can’t describe. Do NOT skip that parsley, trust me! The ingredients themselves are very classic Waldorf Salad, it’s the dressing where I’m mixing it up. You can still add more ingredients if you like! Some more yummy fruit you could add to this salad is bananas, red grapes, pears, and any variety of apple! If you don’t have toasted walnuts on hand, you can make them yourself! 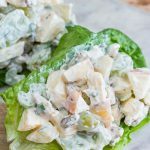 I hope you enjoy today’s fun twist on a classic Waldorf salad! For more yummy similar recipes, please check out our Fresh Fruit Salad and Easy Creamy Cranberry Salad! For more recipes please visit my blog https://ThisSillyGirlsKitchen.com, see you there! Place cut apple, celery, raisins, grapes, and walnuts in a large bowl. Set aside. In a small bowl, whisk together the dressing ingredients. Pour dressing over the salad ingredients. Mix to combine, serve in lettuce cups (optional).